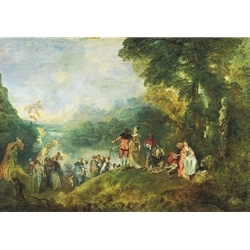 One of the first Rococo painters was Jean-Antoine Watteau, whose work began to epitomize the movement with its idyllic and charming approach. Another artist that represented the Rococo period was Francois Boucher, who created paintings and designed tapestries for the French royalty and nobility. The style appealed to the senses rather than intellect, stressing beauty over depth. The movement portrayed the life of the aristocracy, preferring themes of romance, mythology, fantasy and every day life. Dominated by feminine taste and influence, the lively colors and playful subject matter made it suitable for interior decoration. The Rococo style is sometimes considered to be the end of the Baroque period and was eventually replaced by Neoclassicism during the American and French Revolutions at the end of the eighteenth century.